The native form of this personal name is Blaskó Béla Ferenc Dezső. This article uses Western name order when mentioning individuals. Béla Ferenc Dezső Blaskó (Hungarian: [ˈbeːlɒ ˈfɛrɛnt͡s ˈdɛʒøː ˈblɒʃkoː]; 20 October 1882 – 16 August 1956), better known as Bela Lugosi (/ləˈɡoʊsi/; Hungarian: [ˈluɡoʃi]), was a Hungarian-American actor best remembered for portraying Count Dracula in the 1931 film and for his roles in other horror films. After playing small parts on the stage in his native Hungary, Lugosi gained his first role in a film in 1917. He had to leave the country after the failed Hungarian Communist Revolution of 1919 because of his socialist activism. He acted in several films in Weimar Germany before arriving in the United States as a seaman on a merchant ship. In 1927, he appeared as Count Dracula in a Broadway adaptation of Bram Stoker's novel. He later appeared in the 1931 film Dracula directed by Tod Browning and produced by Universal Pictures. Through the 1930s, he occupied an important niche in horror films, with their East European setting, but his Hungarian accent limited his potential casting, and he unsuccessfully tried to avoid typecasting. Lugosi, the youngest of four children, was born Béla Ferenc Dezső Blaskó in Lugos, Kingdom of Hungary (now Lugoj, Romania) to Hungarian father István Blaskó, a banker, and Serbian-born mother Paula de Vojnich. He later based his last name on his hometown. He and his sister Vilma were raised in a Roman Catholic family. At the age of 12, Lugosi dropped out of school. He began his acting career in 1901 or 1902. His earliest known performances are from provincial theatres in the 1903–04 season, playing small roles in several plays and operettas. He went on to perform in Shakespeare's plays. After moving to Budapest in 1911, he played dozens of roles with the National Theatre of Hungary between 1913–19. Although Lugosi would later claim that he "became the leading actor of Hungary's Royal National Theatre", almost all his roles there were small or supporting parts. During World War I, he served as an infantryman in the Austro-Hungarian Army from 1914–16, rising to the rank of Lieutenant. He was awarded the Wound Medal for wounds he suffered while serving on the Russian front. Due to his activism in the actors' union in Hungary during the revolution of 1919, he was forced to flee his homeland. He went first to Vienna before settling in Berlin (in the Langestrasse), where he continued acting. He took the name "Lugosi" in 1903 to honor his birthplace, and eventually travelled to New Orleans, Louisiana as a crewman aboard a merchant ship. Lugosi's first film appearance was in the movie Az ezredes (The Colonel, 1917). When appearing in Hungarian silent films, he used the stage name Arisztid Olt. Lugosi made 12 films in Hungary between 1917 and 1918 before leaving for Germany. Following the collapse of Béla Kun's Hungarian Soviet Republic in 1919, leftists and trade unionists became vulnerable. Lugosi was proscribed from acting due to his participation in the formation of an actors' union. Exiled in Weimar-era Germany, he began appearing in a small number of well-received films, among them adaptations of the Karl May novels On the Brink of Paradise (Auf den Trümmern des Paradieses, 1920) and Caravan of Death (Die Todeskarawane, also 1920) with Dora Gerson (Gerson, who was Jewish, died in Auschwitz). Lugosi left Germany in October 1920, intending to emigrate to the United States, and entered the country at New Orleans in December 1920. He made his way to New York and was inspected by immigration officers at Ellis Island in March 1921. He declared his intention to become a US citizen in 1928; on June 26, 1931, he was naturalized. On his arrival in America, the 6-foot-1-inch (1.85 m), 180-pound (82 kg) Lugosi worked for some time as a laborer, and then entered the theater in New York City's Hungarian immigrant colony. With fellow expatriate Hungarian actors he formed a small stock company that toured Eastern cities, playing for immigrant audiences. 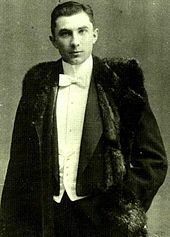 Lugosi acted in several Hungarian plays before breaking out into his first English Broadway play, The Red Poppy, in 1922. Three more parts came in 1925–26, including a five-month run in the comedy-fantasy The Devil in the Cheese. In 1925, he appeared as an Arab Sheik in Arabesque which premiered in Buffalo, New York at the Teck Theatre before moving to Broadway. His first American film role was in the melodrama The Silent Command (1923). Several more silent roles followed, villains and continental types, all in productions made in the New York area. Lugosi in Dracula, the role for which he became most widely known. Lugosi was approached in the summer of 1927 to star in a Broadway theatre production of Dracula, which had been adapted by Hamilton Deane and John L. Balderston from Bram Stoker's 1897 novel. The Horace Liveright production was successful, running for 261 performances before touring the United States to much fanfare and critical acclaim throughout 1928 and 1929. In 1928, Lugosi decided to stay in California when the play ended its West Coast run. His performance had piqued the interest of Fox Film, and he was cast in the studio's silent film The Veiled Woman (1929). He also appeared in the film Prisoners (also 1929), believed lost, which was released in both silent and talkie versions. In 1929, with no other film roles in sight, he returned to the stage as Dracula for a short West Coast tour of the play. Lugosi remained in California where he resumed his film work under contract with Fox, appearing in early talkies often as a heavy or an "exotic sheik". He also continued to lobby for his prized role in the film version of Dracula. Despite his critically acclaimed performance on stage, Lugosi was not Universal Pictures' first choice for the role of Dracula when the company optioned the rights to the Deane play and began production in 1930. [a] Different prominent actors were considered before Browning cast Lugosi for the role, but the film was a hit. Through his association with Dracula (in which he appeared with minimal makeup, using his natural, heavily accented voice), Lugosi found himself typecast as a horror villain in films such as Murders in the Rue Morgue (1932), The Raven (1935), and Son of Frankenstein (1939) for Universal, and the independent White Zombie (1932). His accent, while a part of his image, limited the roles he could play. Lugosi did attempt to break type by auditioning for other roles. He lost out to Lionel Barrymore for the role of Grigori Rasputin in Rasputin and the Empress (also 1932); C. Henry Gordon for the role of Surat Khan in Charge of the Light Brigade (1936), and Basil Rathbone for the role of Commissar Dimitri Gorotchenko in Tovarich (1937) for a role Lugosi had played on stage). He played the elegant, somewhat hot-tempered General Nicholas Strenovsky-Petronovich in International House. Regardless of controversy, five films at Universal — The Black Cat (1934), The Raven (1935), The Invisible Ray (1936), Son of Frankenstein (1939), Black Friday (1940), plus minor cameo performances in Gift of Gab (1934) and two at RKO Pictures, You'll Find Out (1940) and The Body Snatcher (1945) — paired Lugosi with Boris Karloff. Despite the relative size of their roles, Lugosi inevitably received second billing, below Karloff. There are contradictory reports of Lugosi's attitude toward Karloff, some claiming that he was openly resentful of Karloff's long-term success and ability to gain good roles beyond the horror arena, while others suggested the two actors were — for a time, at least — good friends. Karloff himself in interviews suggested that Lugosi was initially mistrustful of him when they acted together, believing that the Englishman would attempt to upstage him. When this proved not to be the case, according to Karloff, Lugosi settled down and they worked together amicably (though some have further commented that the English Karloff's on-set demand to break from filming for mid-afternoon tea annoyed Lugosi). Karloff also insinuated that his rival could not act, claiming Lugosi had "never learned his trade". A small percentage of critics cited his "dull and slow performance" in Dracula as a great example of minimal dialogue with no real acting prowess needed. Lugosi did get a few heroic leads, as in Universal's The Black Cat after Karloff had been accorded the more colorful role of the villain, The Invisible Ray, and a romantic role in producer Sol Lesser's adventure serial The Return of Chandu (1934), but his typecasting problem appears to have been too entrenched to be alleviated by those films. Lugosi addressed his plea to be cast in non-horror roles directly to casting directors through his listing in the 1937 Players Directory, published by the Academy of Motion Picture Arts and Sciences, in which he (or his agent) calls the idea that he is only fit for horror films "an error." A number of factors began to work against Lugosi's career in the mid-1930s. Universal changed management in 1936, and because of a British ban on horror films, dropped them from their production schedule; Lugosi found himself consigned to Universal's non-horror B-film unit, at times in small roles where he was obviously used for "name value" only. Throughout the 1930s, Lugosi, experiencing a severe career decline despite popularity with audiences (Universal executives always preferred his rival Karloff), accepted many leading roles from independent producers like Nat Levine, Sol Lesser, and Sam Katzman. These low-budget thrillers indicate that Lugosi was less discriminating than Karloff in selecting screen vehicles, but the exposure helped Lugosi financially if not artistically. Lugosi tried to keep busy with stage work, but had to borrow money from the Actors Fund of America to pay hospital bills when his only child, Bela George Lugosi, was born in 1938. Historian John McElwee reports, in his 2013 book Showmen, Sell It Hot!, that Bela Lugosi's popularity received a much-needed boost in August 1938, when California theater owner Emil Umann revived Dracula and Frankenstein as a special double feature. The combination was so successful that Umann scheduled extra shows to accommodate the capacity crowds, and invited Lugosi to appear in person, which thrilled new audiences that had never seen Lugosi's classic performance. "I owe it all to that little man at the Regina Theatre," said Lugosi of exhibitor Umann. "I was dead, and he brought me back to life." Universal took notice of the tremendous business and launched its own national re-release of the same two horror favorites. The studio then rehired Lugosi to star in new films. The first was Universal's Son of Frankenstein (1939), when he played the character role of Igor, a mad blacksmith with a broken neck, in heavy makeup and beard. 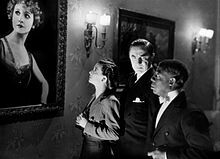 The same year saw Lugosi making a rare appearance in an A-list motion picture: he was a stern commissar in Metro-Goldwyn-Mayer's romantic comedy Ninotchka, starring Greta Garbo and directed by Ernst Lubitsch. He was effective in this small but prestigious character role, and it could have been a turning point for the actor, but within the year, he was back on Hollywood's Poverty Row, playing leads for Sam Katzman. These horror, comedy and mystery B-films were released by Monogram Pictures. At Universal, he often received star billing for what amounted to a supporting part. The Gorilla (1939) had him playing straight man to Patsy Kelly and the Ritz Brothers. Ostensibly due to injuries received during military service, Lugosi developed severe, chronic sciatica. Though at first he was treated with pain remedies such as asparagus juice, doctors increased the medication to opiates. The growth of his dependence on analgesic drugs, particularly morphine and, after 1947 when it became available in America, methadone, was directly proportional to the dwindling of screen offers. He was finally cast in the role of Frankenstein's monster for Universal's Frankenstein Meets the Wolf Man (1943), but Lugosi had no dialogue. Lugosi's voice had been dubbed over that of Lon Chaney, Jr., from line readings at the end of The Ghost of Frankenstein (1942). Lugosi played Dracula for a second and last time on film in Abbott and Costello Meet Frankenstein (1948). Abbott and Costello Meet Frankenstein was Bela Lugosi's last "A" movie. For the remainder of his life he appeared — less and less frequently — in obscure, low-budget features. From 1947 to 1950, he performed in summer stock, often in productions of Dracula or Arsenic and Old Lace, and during the other parts of the year made personal appearances in a touring "spook show", and on early commercial television. In September 1949 Milton Berle invited Lugosi to appear in a sketch on Texaco Star Theatre. Lugosi memorized the script for the skit, but became confused on the air when Berle began to ad lib. His only television dramatic role was on the anthology series Suspense on October 11, 1949, in an adaptation of Edgar Allan Poe's The Cask of Amontillado. In 1951, while in England to play a six-month tour of Dracula, Lugosi co-starred in a lowbrow film comedy, Mother Riley Meets the Vampire (also known as Vampire over London and My Son, the Vampire) released the following year. Following his return to the United States, he was interviewed for television, and reflected wistfully on his typecasting in horror parts: "Now I am the boogie man." In the same interview he expressed a desire to play more comedy, as he had in the Mother Riley farce. Independent producer Jack Broder took Lugosi at his word, casting him in a jungle-themed comedy, Bela Lugosi Meets a Brooklyn Gorilla (1952) co-starring nightclub comedians Duke Mitchell and Sammy Petrillo, whose act closely resembled that of Dean Martin and Jerry Lewis. Lugosi enjoyed a lively career on stage. with plenty of personal appearances. As film offers declined, he became more and more dependent on live venues to support his family. Bela took over the role of Jonathan Brewster from Boris Karloff for Arsenic and Old Lace. Bela had also expressed interest in playing Elwood P. Dowd in Harvey to help himself professionally. He also made plenty of personal appearances to promote his horror image and/or an accompanying film. Late in his life, Bela Lugosi again received star billing in films when the ambitious but financially limited filmmaker Ed Wood, a fan of Lugosi, found him living in obscurity and near-poverty and offered him roles in his films, such as an anonymous narrator in Glen or Glenda (1953) and a Dr. Frankenstein-like mad scientist in Bride of the Monster (1955). During post-production of the latter, Lugosi decided to seek treatment for his drug addiction, and the premiere of the film was said to be intended to help pay for his hospital expenses. According to Kitty Kelley's biography of Frank Sinatra, when the entertainer heard of Lugosi's problems, he helped with expenses and visited Lugosi at the hospital. Sinatra would recall Lugosi's amazement at his visit, since the two men had never met before. During an impromptu interview upon his exit from the treatment center in 1955, Lugosi stated that he was about to go to work on a new Ed Wood film, The Ghoul Goes West. This was one of several projects proposed by Wood, including The Phantom Ghoul and Dr. Acula. With Lugosi in his Dracula cape, Wood shot impromptu test footage, with no storyline in mind, in front of Tor Johnson's home, a suburban graveyard, and in front of Lugosi's apartment building on Carlton Way. This footage ended up in Plan 9 from Outer Space (1959), which was mostly filmed after Lugosi died. Wood hired Tom Mason, his wife's chiropractor, to double for Lugosi in additional shots. Mason was noticeably taller and thinner than Lugosi, and had the lower half of his face covered with his cape in every shot, as Lugosi sometimes did in Abbott and Costello Meet Frankenstein. Following his treatment, Lugosi made one final film, in late 1955, The Black Sleep, for Bel-Air Pictures, which was released in the summer of 1956 through United Artists with a promotional campaign that included several personal appearances. To Lugosi's disappointment, however, his role in this film was that of a mute, with no dialogue. 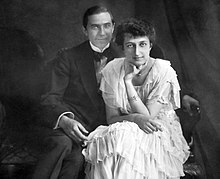 In 1917, Lugosi married Ilona Szmik. The couple divorced in 1920, reputedly over political differences with her parents. In 1921, he married Ilona von Montagh, and divorced in 1924. In 1929, Lugosi took his place in Hollywood society and scandal when he married wealthy San Francisco resident Beatrice Weeks, widow of architect Charles Peter Weeks. She filed for divorce four months later, citing actress Clara Bow as the "other woman". On 26 June 1931, Lugosi became a naturalized United States citizen. In 1933, he married 19-year-old Lillian Arch, the daughter of Hungarian immigrants. They had a child, Bela G. Lugosi, in 1938. Bela had four grandchildren and six great-grandchildren. Lillian and Bela, as well as his mother, vacationed on their lake property in Lake Elsinore, California (then called Elsinore), on two lots between 1944 and 1953. Bela Lugosi Jr. attended the Elsinore Naval & Military School in Lake Elsinore. Lillian and Béla divorced in 1953, at least partially because of Béla's jealousy over Lillian taking a full-time job as an assistant to Brian Donlevy on the sets and studios for Donlevy's radio and television series Dangerous Assignment – Lillian eventually did marry Brian Donlevy, in 1966. Lugosi married Hope Lininger, his fifth wife, in 1955; they remained married until his death. She had been a fan, writing letters to him when he was in the hospital, recovering from addiction to Demerol. She would sign her letters "A dash of Hope". She died in 1997 at age 77. Lugosi died of a heart attack on August 16, 1956, while lying on a bed in his Los Angeles apartment. He was 73. The rumor that Lugosi was clutching the script for The Final Curtain, a planned Ed Wood project, at the time of his death is not true. 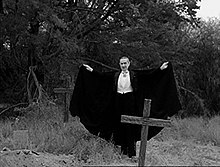 Lugosi was buried wearing one of the "Dracula" cape costumes in the Holy Cross Cemetery in Culver City, California. Contrary to popular belief, Lugosi never requested to be buried in his cloak; Bela G. Lugosi confirmed on numerous occasions that he and his mother, Lillian, actually made the decision but believed that it is what his father would have wanted. In Tim Burton's Ed Wood, Lugosi is portrayed by Martin Landau, who received the 1994 Academy Award for Best Supporting Actor for the performance. According to Bela G. Lugosi (his son), Forrest Ackerman, Dolores Fuller and Richard Sheffield, the film's portrayal of Lugosi is inaccurate: In real life, he never used profanity, owned small dogs, or slept in coffins. And contrary to this film, Bela did not struggle performing on The Red Skelton Show. Three Lugosi projects were featured on the television show Mystery Science Theater 3000. The 1942 film The Corpse Vanishes appeared in episode 105; the serial The Phantom Creeps appeared throughout season two, and the Ed Wood production Bride of the Monster in episode 423. An episode of Sledge Hammer! 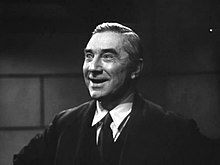 titled "Last of the Red Hot Vampires" was an homage to Bela Lugosi; at the end of the episode, it was dedicated to "Mr. Blasko". In 2001, BBC Radio 4 broadcast There Are Such Things by Steven McNicoll and Mark McDonnell. Focusing on Lugosi and his well-documented struggle to escape from the role that had typecast him, the play went on to receive the Hamilton Dean Award for best dramatic presentation from the Dracula Society in 2002. 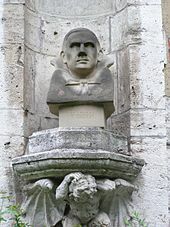 A statue of Lugosi was erected on one of the corners of the Vajdahunyad Castle in Budapest. The Ellis Island Immigration Museum in New York City features a live 30-minute play that focuses on Lugosi's illegal entry into the country and then his arrival at Ellis Island to enter the country legally. The cape Lugosi wore in Dracula (1931) survives today in the ownership of Universal Studios. The theatrical play Lugosi - the Shadow of the Vampire (Hungarian: Lugosi - a vámpír árnyéka) is based on Lugosi's life, telling the story of his life as he became typecast as Dracula and as his drug addiction worsened. He was played by one of Hungary's most renowned actors, Ivan Darvas. Andy Warhol's 1963 silkscreen The Kiss depicts Lugosi from Dracula about to bite into the neck of co-star Helen Chandler, who played Mina Harker. A copy sold for $798,000 at Christie's in May 2000. Lugosi was also the subject of "Bela Lugosi's Dead", the first single by the English band Bauhaus. Released in August 1979, it is often considered to be the first gothic rock record. Lugosi's star on the Hollywood Walk of Fame is mentioned in "Celluloid Heroes", a song performed by The Kinks and written by their lead vocalist and principal songwriter, Ray Davies. It appeared on their 1972 album Everybody's in Show-Biz. A fan of the occult, Lugosi's haunted mirror is on display at Zak Bagans' haunted museum in Las Vegas, Nevada. ^ A persistent rumor asserts that director Tod Browning's long-time collaborator Lon Chaney was Universal's first choice for the role, and that Lugosi was chosen only due to Chaney's death shortly before production. This is questionable because Chaney had been under long-term contract to Metro-Goldwyn-Mayer since 1925, and had negotiated a lucrative new contract just before his death. Chaney and Browning had worked together on several projects (including four of Chaney's final five releases), but Browning was only a last-minute choice to direct the movie version of Dracula after the death of director Paul Leni, who had originally been slated to direct. ^ California's descendibility statute for rights of publicity, Civil Code Section 990, was enacted in 1988, and Lugosi's estate now licenses the commercial use of his name and image. The right of publicity in some states endures for 50, 70, 75 or 100 years past the death of the celebrity. ^ a b "From the Archives: Actor Bela Lugosi, Dracula of Screen, Succumbs After Heart Attack at 73". Los Angeles Times. August 17, 1956. Retrieved December 31, 2016. ^ a b c d e f g Osborn, Jennifer (editor); Milano, Roy (photo captions) (2006). Monsters: A Celebration of the Classics from Universal Studios. New York, NY: Del Ray Books, imprint of Random House, Inc. p. 38. ISBN 0-345-48685-4. CS1 maint: Extra text: authors list (link) Referenced information is from an essay in the book written by his son Bela G. Lugosi. ^ "United States Census, 1930," database with images, FamilySearch (https://familysearch.org/ark:/61903/1:1:XCJB-Z61 : accessed 20 May 2018), Bela Lugosi, Los Angeles (Districts 0001-0250), Los Angeles, California, United States; citing enumeration district (ED) ED 47, sheet 9A, line 4, family 193, NARA microfilm publication T626 (Washington D.C.: National Archives and Records Administration, 2002), roll 133; FHL microfilm 2,339,868. ^ Rhodes, Gary (1997). Lugosi: His Life in Films, on Stage, and in the Hearts of Horror Lovers. ISBN 0-7864-0257-1. ^ Arthur Lennig, The Immortal Count, University Press of Kentucky, 2003, p. 21; ISBN 978-0-8131-2273-1. ^ Arthur Lennig, The Immortal Count, University Press of Kentucky, 2003, pp. 25–26, 28–29; ISBN 978-0-8131-2273-1. ^ "15 Intriguing Halloween-Related Factoids!". Huffington Post. 3 November 2011. ^ a b Mank, Gregory W. (2009). Bela Lugosi and Boris Karloff : the expanded story of a haunting collaboration, with a complete filmography of their films together. Jefferson, N.C.: McFarland & Co., Publishers. pp. 22–23. ISBN 9780786434800. OCLC 607553826. ^ Ancestry.com. Selected U.S. Naturalization Records — Original Documents, 1790–1974 (World Archives Project) [database on-line]. Provo, Utah, US: The Generations Network, Inc., 2009. ^ Skal, David (2004). Hollywood Gothic. New York City: Faber and Faber Inc. p. 124. ISBN 9780571211586. ^ Bela Lugosi profile, ibdb.com; accessed 1 November 2015. ^ Rhodes, Gary Don (1997). "Stage Appearances". Lugosi: his life in films, on stage, and in the hearts of horror lovers (Google Books). p. 169. Retrieved 18 February 2009. ^ Lennig, Arthur (2010). Immortal count : the life and films of bela lugosi. Lexington: Univ Pr Of Kentucky. ISBN 0813126614. ^ "Prisoners (1929)". IMDb. IMDb.com, Inc. Retrieved 7 December 2015. ^ "Biography (TV Series): Bela Lugosi: Hollywood's Dark Prince". IMDb. IMDb.com, Inc. Retrieved 7 December 2015. ^ "12 Surprising Facts About Bela Lugosi". 2016-08-16. Retrieved 2017-08-04. ^ a b Kaffenberger, Bill; Rhodes, Gary (2015). Bela Lugosi In Person. BearManor Media. ISBN 1593938055. ^ Mank, Gregory William (2009). Bela Lugosi and Boris Karloff : the expanded story of a haunting collaboration, with a complete filmography of their films together. Jefferson, N.C.: McFarland & Co., Publishers. pp. 237–238. ISBN 0786434805. ^ Michael Mallory. Universal Studios Monsters: A Legacy of Horror, 2009, Universe, p. 63. ISBN 978-0-7893-1896-1. ^ "Bela Lugosi | Hungarian-American actor". Encyclopedia Britannica. Retrieved 2017-08-04. ^ Star Theater Episode Guide, tv.com; accessed 1 November 2015. ^ Weaver, Tom (2004). Science Fiction and Fantasy Film Flashbacks: Conversations with 24 Actors, Writers, Producers and Directors from the Golden Age. McFarland. p. 160. ISBN 0-7864-2070-7. ^ Kaffenberger, Bill; Rhodes, Gary (2012). No Traveler Returns: The Lost Years of Bela Lugosi. BearManor Media. ISBN 1593932855. ^ Kelley, Kitty (1987). His Way: The Unauthorized Biography of Frank Sinatra. Bantam Books. p. 248. ISBN 0-553-26515-6. ^ Nuzum, Eric. "Bela Lugosi's Legacy". Lost. Archived from the original on 17 September 2008. Retrieved 2008-10-08. ^ a b Rhodes, Gary; Sheffield, Richard (2007). Bela Lugosi: Dreams and Nightmares. Collectables Press. ISBN 0977379817. ^ Arthur Lennig, The Immortal Count, University Press of Kentucky, 2003, p. 68; ISBN 978-0-8131-2273-1. ^ "Friedemann O'Brien Goldberg & Zarian Names Bela G. Lugosi Of Counsel". Metropolitan News-Enterprise. Retrieved 2008-04-20. Bela G. Lugosi, a well-known Los Angeles trial and entertainment lawyer and son of the actor famed for his portrayals of Count Dracula, has become of counsel to the downtown office of Friedemann O'Brien Goldberg & Zarian. ^ "Divorced". Time. 27 July 1953. Archived from the original on 30 March 2008. Retrieved 21 March 2008. Bela Lugosi, 68, veteran Hollywood cinemonster (Dracula); by his third wife, Lillian Arch Lugosi, 41, on the ground that his 'unfounded jealousy' constituted mental cruelty; after 20 years of marriage, one son; in Los Angeles. ^ Arthur Lennig, The Immortal Count, University Press of Kentucky, 2003, p. 393; ISBN 978-0-8131-2273-1. ^ Rhodes, Gary Don (1997). Lugosi: His Life in Films, on Stage, and in the Hearts of Horror Lovers. McFarland. p. 36. ISBN 0-7864-0257-1. ^ "Lugosi v. Universal Pictures, 603 P.2d 425 (Cal. 1979)". FindLaw. Archived from the original on 9 March 2007. Retrieved 14 February 2007. In this decision preceding (and precipitating) the Legislature's enactment of Section 990, the California Supreme Court held that rights of publicity were not descendible in California. Bela Lugosi's heirs, Hope Lininger Lugosi and Bela George Lugosi, sued to enjoin and recover profits from Universal Pictures for licensing Lugosi's name and image on merchandise reprising Lugosi's title role in the 1931 film Dracula. The California Supreme Court faced the question whether Bela Lugosi's film contracts with Universal included a grant of merchandising rights in his portrayal of Count Dracula, and the descendibility of any such rights. Adopting the opinion of Justice Roth for the Court of Appeal, Second Appellate District, the court held that the right to exploit one's name and likeness is personal to the artist and must be exercised, if at all, by him during his lifetime. Lugosi, 603 P.2d at 431. ^ "Visiting the Ellis Island Immigration Museum". ellisisland.org. Retrieved 1 November 2015. ^ Andy Warhol (1928–1987): The Kiss (Bela Lugosi), christies.com; accessed 1 November 2015. ^ Palmer, Bob. "Everybody's in Showbiz". Rolling Stone. Wordpress.com VIP. Retrieved 21 February 2019. Wikimedia Commons has media related to Bela Lugosi. "Bela Lugosi". Legendary Stage and Screen Actor. Find a Grave. January 1, 2001. Retrieved January 12, 2013.